Helen’s Restaurant opened for business on Main Street in Machias in 1950. Helen and Larry Mugnai along with Larry’s brother Julie and sister Esther ran the restaurant, building the reputation of great homemade food…and no one who had one could ever forget those pies! In 1976 a customer who often teased Larry about selling Helen’s was surprised one day when Larry said he was ready to sell. Bob and Joan Carter purchased Helen’s with Larry staying on board to help during the transition. With crowds waiting up the street for a seat and poor parking on Main Street, the Carters decided to move Helen’s to its present location in 1983. The Carters sold the restaurant to Joan’s sister Judy and her husband Gary Hanscom (with Larry still in the bakery). With encouragement and help from Mugnai, Judy & Gary Hanscom opened Helen’s of Ellsworth in 1994. Larry Mugnai then retired from Helen’s after 44 years. Judy and Gary eventually sold the Ellsworth business to their Operating Manager Melanie Omlor-Fox, who had also been an employee for them in the late 80s at the Machias Location. 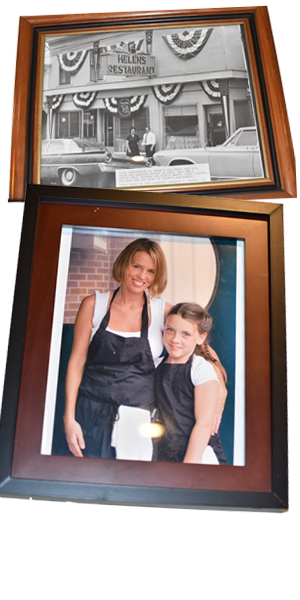 Helen’s of Ellsworth is honored to employ four 20+ year staff members: 2 bakers, a cook and a server. We feel confident that with the longevity of many of our employees, who take such pride in customer satisfaction, that your experience will be nothing less than exceptional. From our family to yours, thank you for choosing Helen’s Restaurant!